Design and practicality are often at odds. A feature may look pretty but that doesn&apos;t mean it will serve its purpose. 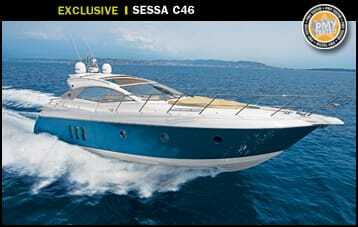 The design team at Sessa, headed by Christian Grande, worked hard not to fall prey to this age-old binary, trying throughout the creation process of the new C46 to brace function with form. And although at first glance, it seemed that some styling may have superceded pragmatism, on closer inspection I found that most every feature aboard not only had a smart look but was also built with a purpose, made of high-grade materials, and could be easily maintained. Large scuttles in the teak-and-holly saloon sole are prime examples of how pleasing joinery doesn&apos;t have to hinder access. They&apos;re light due to their plywood cores but provide shoulder-wide access to the bilges, which contain a 114-gallon aluminum water tank and 41-gallon black-water tank. Forward, the VIP has a scissor berth—twins that close together to form a queen— with drawers at the foot of each bed so accessing stowed items is simple in either configuration. 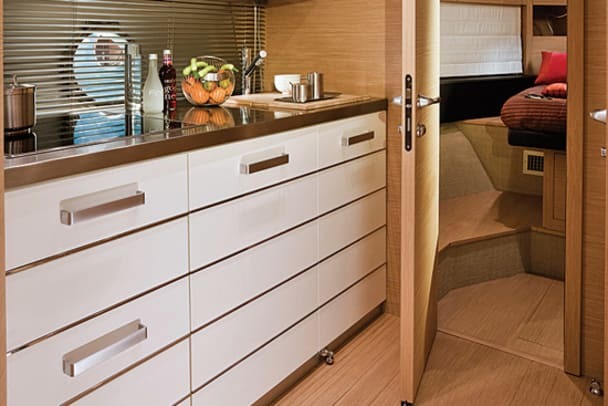 The aft master, with its angular flooring and tiered ceiling, has its main hanging locker in the entryway—the only part of the cabin with standing headroom—so owners need not slouch to get dressed. Topsides, the mixture of smart looks and function continues, but with a twist. The enclosed helm area—where owners and guests will likely spend most of their time—is not only functional, but successfully brings the outdoors into an enclosed space. Sound oxymoronic? I was skeptical, too. 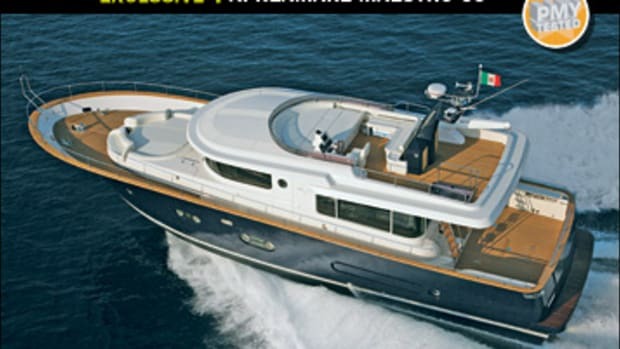 For example, at first the 5&apos;0" x 6&apos;3" sunpad to port of the starboard-side helm seemed out of place. 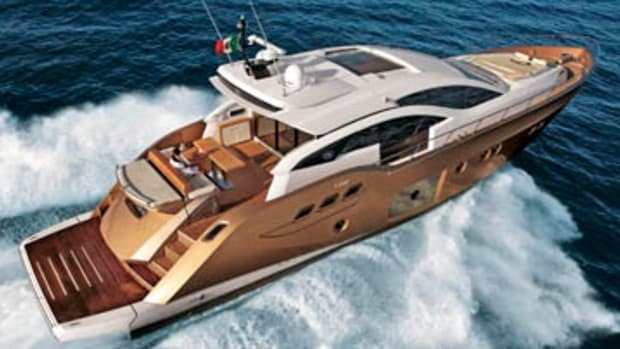 Understandably, Sessa created it with the thought of leaving plenty of headroom below in the galley and entryway into the master. But a sunpad of that size in an enclosed helm area? Well after dangling my legs from the comfortably cushioned platform, with a good view to all points and the sun pouring in through the 8&apos;41⁄2" x 4&apos;5" sunroof, I began to warm to the concept. What finally sold me was a button in the electric panel on the helm console. When I pressed it, a 19-inch Toshiba LCD TV appeared from under the sunpad headrest, a crafty way to have a television topside but keep it shaded. There are other elements here where the designers meshed the openness of the outdoors with indoor conveniences, while retaining both style and function. 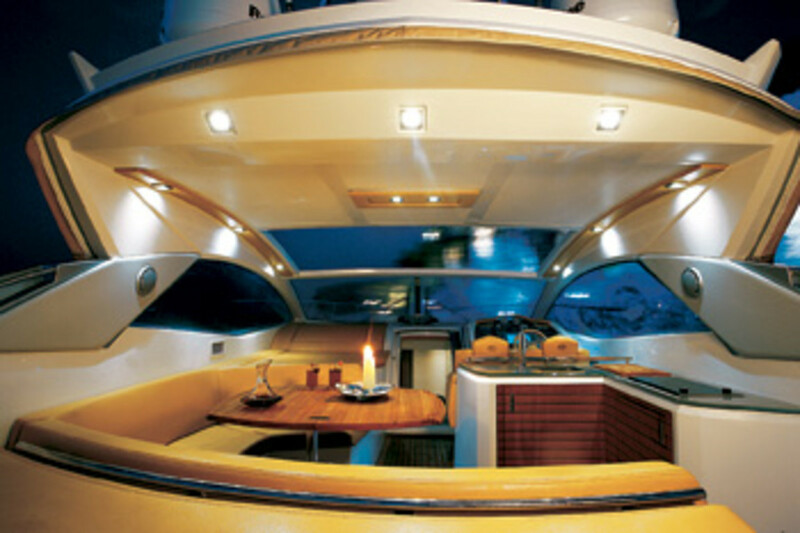 A large wet bar/galley with a two-burner Bosch electric cooktop inset into a glass countertop sits aft and to starboard, far enough from the radar arch so cooking won&apos;t damage the overhead. Beneath the cooktop, and hidden in teak-paneled cabinetry, are both a microwave and an Isotherm ice maker. And although the ice maker has fitted wooden-panel skirting, you can quickly unscrew the skirt for full access to the wet bar plumbing if you need to make repairs. Another hidden, but easily accessible, feature is underneath the bench-style helm seat (with its ergonomic back supports). Part of the optional 24,000-Btu, zone-controlled air conditioner system cools the entire area (as well as the interior) if the isinglass enclosure is zipped tight. 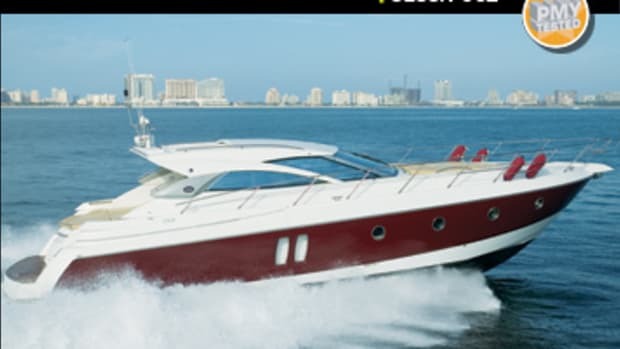 The helm layout proved particularly practical when I took the wheel on the way out Dania Cut in Fort Lauderdale. 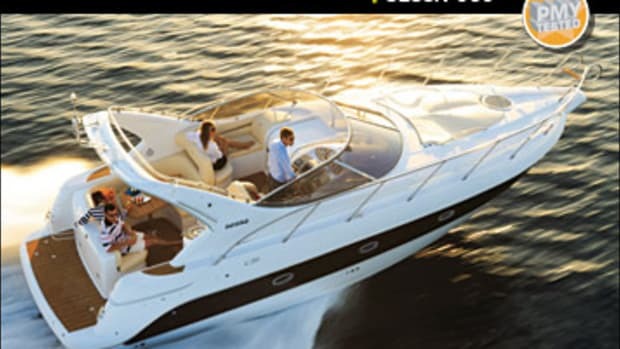 Its nearly symmetrical setup was divided in two by an optional Raymarine E120 display, with Volvo Penta engine readouts at eye-level on both sides, push-button panels in easy reach, and analog readouts centered above. Although there is no access to the back of the station from inside, you can remove sections to get to the wiring. The only instrument that was slightly obscured was the wheel-position indicator, tucked just forward of the wheel. When we reached open water, the confused three-to-four-foot seas wouldn&apos;t provide us with a place to collect data, so we cruised down the Intracoastal to a canal area where we had flat water and nearly no wind for our reciprocal test runs. Topping out at 36 mph, the C46 zipped ahead of the bumper-to-bumper cars heading down the adjacent U.S. Route 1. After collecting the data (see "By the Numbers" this story), we headed back out to the open ocean. As I&apos;d expected, I had to close the sunroof and flip on the wipers. Even with the rather wet ride, I noticed no slamming in the discordant chop, which I attribute, in part, to a moderate 15-degree mid-section deadrise. 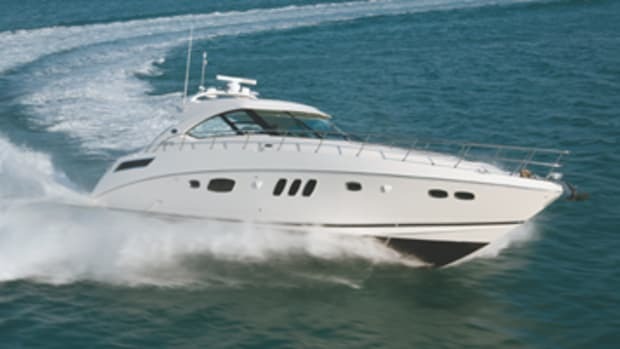 With the wheel hard over, the C46 made four-boatlength turns at WOT with only moderate heel, an attribute that owes much to Volvo Penta&apos;s willingness to assist in the design of hulls for its IPS system. The only drawback I found on the water was with the stainless steel bezel surrounding a hatch in the dashboard, which illuminates the saloon below. The stainless steel glared in the sun, reflecting off the steeply sloped windshield, creating a shiny ring in my center of vision. A matte finish would be advisable. Docking the C46 is about as foolproof as it gets. 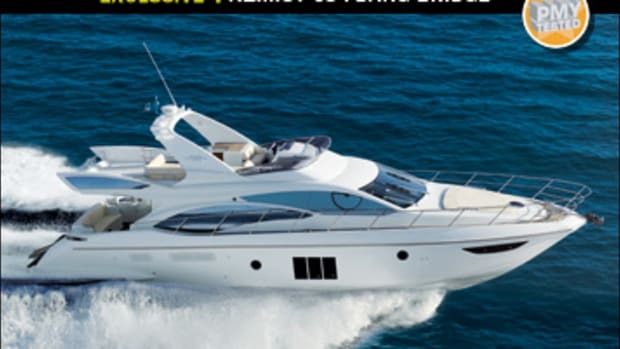 For starters, sightlines are clear all around, with the exception of the port quarter, which the tender garage obscures. Sessa solved this mild inconvenience with an optional static rear-facing camera fastened to the radar arch, which gives you a clear view of both aft quarters on the Raymarine E120 display (you can also toggle to a stationary engine room camera). Of course, the IPS joystick makes getting the C46 into a slip even easier. High and low speeds allow you to adjust the amount of gumption applied. 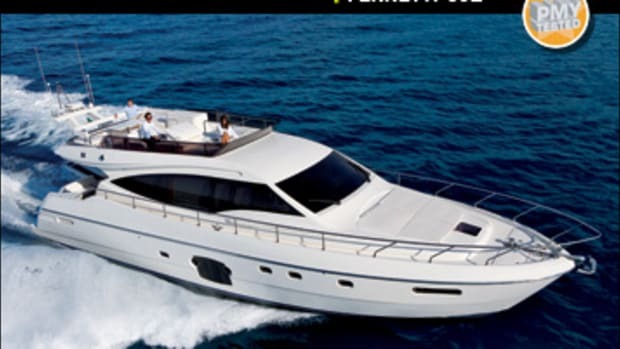 My test boat even came with the optional 8-hp Side Power bow thruster. So much thrust may seem unnecessary, but for anyone who&apos;s ever tried docking in a strong breeze and current—say, the waterfront docks in Beaufort, North Carolina, at mid-tide—will understand why some extra help can come in handy. Once the vessel is in place, crew can enlist port and starboard warping winches to tighten up on the lines, snugging up to a perfect Med-moor no matter where the wind is blowing. While stepping off, I noticed that there were stylish fins on the aft quarters where small steps should be, perhaps the only element where looks and function didn&apos;t align. Sessa has created a boat that, while seemingly unconventional at first, proves that fashion and ingenuity can go hand in hand. With good stowage, smart components, well-laid-out everything, and simple-to-use IPS drives, the C46 is a practical coastal cruiser, whether you&apos;re seated at the helm or lounging on one of her three sunpads. 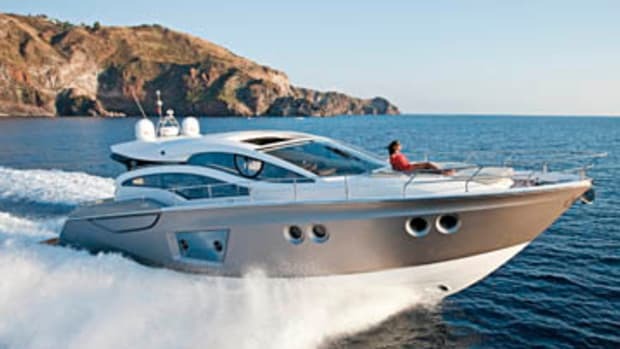 For more information on Sessa Marine, including contact information,click here. Sessa nailed it when it comes to getting around the C46&apos;s ER. A day hatch to starboard, with a small ladder, lets you drop in on the outboard side of the 435-hp Volvo Penta IPS600 diesel. 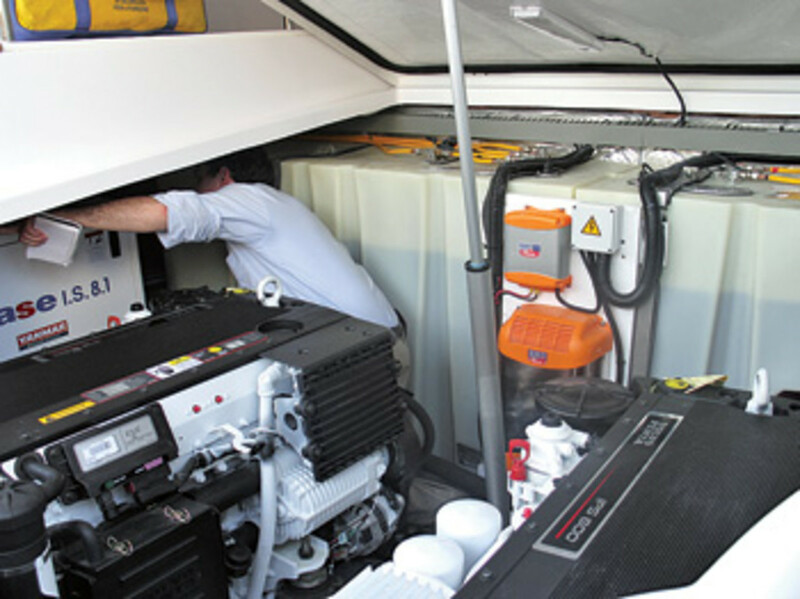 Racors for both the 8-kW Mase genset (to port) and starboard engine are located at the foot of the ladder, as are all eight of the batteries. If the main hatch is open, there&apos;s room to walk around the front of this engine without hunkering; if it&apos;s closed, there&apos;s still room to wiggle. A polyurethane fuel tank takes up the forward bulkhead area—there&apos;s a structural bulkhead forward of it—and its translucence lets you sight fuel amounts. Oil and coolant access are also easy to reach. —G.R. 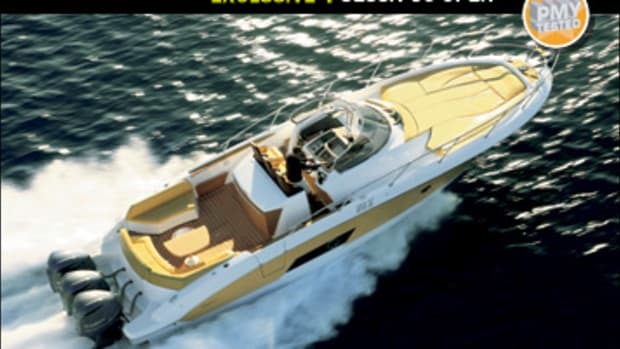 This article originally appeared in the February 2009 issue of Power & Motoryacht magazine.